top rankings | Digital Marketing, Poetry, Reviews, Philosophy, Sports & Tales by Joe Wooldridge. Yellow pages? I am sure some people still use the yellow pages to find what they need. I just don’t know any of them. Like it or not, the relevance of yellow page directories has come and gone. So where does a business spend their marketing dollar to get the best ROI? 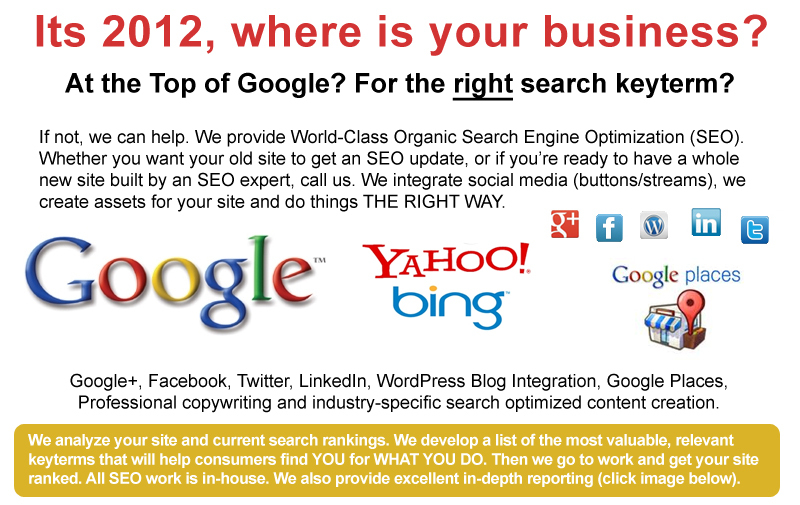 Increasing their visibility for WHAT they do in search rankings at the World’s leading search engines. This doesn’t mean trying to employ some strategy to trick Google, Yahoo! or Bing into putting their listing at the top. That will not work. Even worse, if it did work – it will only be for a matter of hours or a couple of days before the algorithm update – which will relegate the cheating strategy site to search oblivion. Just two days ago I met a potential client who was imagining a strategy of using a lot of little sites in an effort to dominate Google’s rankings! I couldn’t believe that someone had suggested this to them! I wasted no time telling them to ABSOLUTELY AVOID any such strategy. They were aghast at the news. Which brings me to the topic of educating business owners about organic search engine optimization. A good portion of delivering quality SEO is educating the client on the right approach – and mindset of the approach – as well as working to ‘undo’ or delete whatever bad SEO strategies that have affected their rankings negatively. It is amazing how many people don’t understand that they will be penalized for deceptive, shady strategies and/or duplicate content/duplicate listings. Another common hurdle is trying to educate the business owner who wants to be ranked number one for their town, plus all other surrounding towns and areas in organic rankings. This simply does not work. The best search engines provide the best quality of search results. Provide value for site visitors. Yes it is a good idea to be social and use social media to connect with people. Making your business accessible through the latest social media platforms says a few things about your business, namely that A) you are a vibrant and relevant business, and B) you are open to connecting with consumers on the Internet. Having a well-defined presence at Google+, LinkedIn, Facebook, Twitter, Pinterest, etc. also helps establish the accuracy and relevance of your company’s brand. What are some good guidelines to use when discerning the good strategies from the bad? Always strive for accuracy . . be WHO YOU ARE, and WHERE YOU ARE. Adopt the point of view of a search engine and then reflect on that before getting excited about some ‘special strategy’ that someone told you about. RE: #2 above . . . Continually updating the value of a complex, top-secret algorithm that ranks all web sites/pages/content to determine and deliver the highest-quality search results. Continually tweak methods for identifying ‘webspam’ and removing the offending webspam publishers from the indexes of their datacenters. Continually update the datacenters with fresh, relevant content that is being delivered ’round the clock’ by billions of spider bots that crawl and index the information available on the World’s servers. In addition to those efforts, new efforts are being made by the Big Three (Google, Yahoo! and Bing) to improve the formatting of the web by integrating semantics through use of microdata and mutually agreed-upon protocols as in http://www.schema.org (see my blog post on The Semantic Web), which will dramatically increase the overall accuracy of information on the internet. Quality SEO is not rocket science – but more common sense. With Google, you are either part of the problem or part of the solution. Work with you on a plan to remain vibrant and relevant to the online community (which may include social media, adwords campaigns, email marketing and blogging). Q. Can you do these things for yourself? A. Yes. In fact, an effective and winning strategy will most likely require your participation. Q. Should you hire a professional SEO consultant to make sure that your company is optimally presented on the Internet? A. ONLY if market-share is important to the success of your company, and the success of your company is important to you. In 2012 – and the future – how important is the Internet to the success of your company and to garnering a respectable amount of market-share? Consider that 2012 is the year when overall ad spend for digital marketing (Internet) eclipses the amount spent on television advertising and print advertising. Consider that hiring a reputable SEO professional that can show you recent examples of their SEO results, and comes highly recommended is as important as choosing the right doctor, dentist or surgeon. The doctor is in! We look forward to helping your company have success online. Please call 913-271-2955 or contact joe@joewooldridge.com for a free consultation and quote.